A simulation showing how electrical currents behaved in the protoplanetary disc around the sun, potentially forming chondrules. The brighter crescent is an area where the computer rendered the simulation in greater detail. Rocks melted in the early solar system after electrical currents spiked through the cloud of dust circling around the young sun, according to new research. The finding brings scientists a step closer to understanding the origin of the chondrules, or glass beads, that were some of the solar system's first solids. Because chondrules form far away from the sun, astronomers could not figure out how they heated to at least 2,420 degrees Fahrenheit (1,600 degrees Kelvin), since the surrounding environment is much colder, according to observations. More mysteriously, the rocks apparently cooled within an hour or two after forming, instead of freezing instantly into a crystal, which would be expected in space. A typical early meteorite, called a chondrite, could be made up of 70 to 80 percent of this glassy material. "It's a large fraction of mass, even in regions far away from the sun where the sun can't [heat] it," said Mac Low, who is also an adjunct professor at Columbia University. Mac Low co-authored a paper reporting the findings that was published in the March 20 edition of The Astrophysical Journal Letters. Chondrules are one of two types of solids that made up the early solar system. Chondrules are clumps of dust that heated up and cooled rapidly, while the second type of solid — calcium-aluminum rich inclusions (CAIs) — was created from molten gas droplets. A separate study, based on dating techniques, recently proposed that chondrules and CAIs formed at the same timein Earth's solar system, just a few million years after the protoplanetary disc of spinning matter formed around the nascent sun. This spinning disc of matter, Mac Low said, contained an enormous amount of kinetic energy. This was the biggest source of energy for disc motions. Differential rotation, and energy, increased the amount of kinetic energy in the disc as regions closer to the sun rotated faster than regions farther out. Material was dragged on to the young sun through a process called magnetorotational instability. This occurs when a weak magnetic field runs through differentially rotating gas, connecting regions orbiting at different speeds. The turbulence mixed angular momentum outward, allowing the bulk of the gas to fall inward and accrete onto the sun. 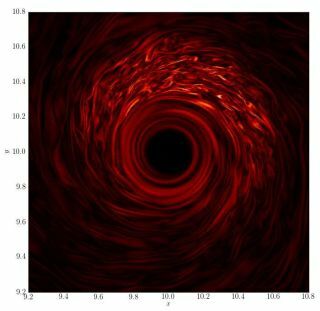 "That appears to be one of the major mechanisms to drive accretion," Mac Low said, adding that it could even be applicable to black holes. In the solar system, however, Mac Low's research team suspects magnetorotational instability may also fuel the formation of chondrules. Magnetized turbulence bends magnetic fields, producing electrical currents. These currents travel through the resistive gas, heating it. This is the same process that allows heating to happen in toasters and electric ovens. The bent magnetic fields in the disc form thin, flat regions of strong electrical current called "current sheets." The production of current sheets by magnetized turbulence has been known by plasma researchers since the 1970s, but Mac Low's team applied this understanding of current sheet formation to protoplanetary discs for the first time. The question was, Mac Low said, how much the sheets heated the rocks. "We might just get a fluorescent light bulb," he joked, adding that it seemed quite possible given most of the protoplanetary disc was made of neutral gas. At first glance, there were not a lot of ions, or charged particles, to carry the current. Museum researcher Alexander Hubbard, co-author of the study, then came upon the answer. A little heating will start to excite the atoms that are easiest to ionize — namely, salty substances such as potassium and sodium. Warming those substances will ionize them, which will increase the available current. With more ions in the current, the substances would heat even more and increase ionization exponentially. "It looks like something that could get us up to the temperature we needed," Mac Low said. Next, the researchers tried to figure out why the chondrules cooled slowly in the cold reaches of space. Dust opacity, or thickness, changes with the temperature. As the dust melted, the highest temperature region formed a transparent cavity, surrounded by opaque material still warmed by radiation from the hottest gas. "The newsworthy conclusion is that under conditions reasonable for protoplanetary discs, these regions can get plenty hot. Sometimes over 2,000 Kelvin (3,140 Fahrenheit), hot enough to melt rocks," Mac Low said. So far, the researchers have simulated this process in only one dimension. The next step will be to move toward a three-dimensional model to better simulate conditions in the early solar system. While the paper did not include new observations, Mac Low pointed out that Chile's Atacama Large Millimeter/submillimeter Array (ALMA) could, in time, partially confirm the findings. "We won't be able to observe individual current sheets ... but ALMA will be able to tell us about dust grain size and distribution," he said of the telescope, which was officially inaugurated this month. The research was led by Denmark's Niels Bohr International Academy and includes scientists from the American Museum of Natural History, Columbia University and the National Autonomous University of Mexico.